Add holiday spirit to any room when you stitch this collection of quick-change motifs! You can download these cute patterns and start stitching right away! Tissue box cover and motifs are all made using 7-count plastic canvas and worsted-weight or plastic canvas yarn. 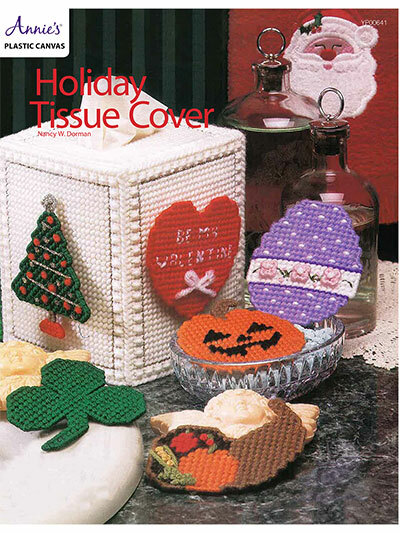 Motifs include a heart, shamrock, pumpkin, Easter egg and Christmas tree. Just add hook-and-loop tape to the back of each motif and stick to side of tissue box cover. Change with the holidays! Size: cover snugly fits a boutique-style tissue box. Designs are made using 7-count plastic canvas and plastic canvas- or #4 worsted-weight yarn. 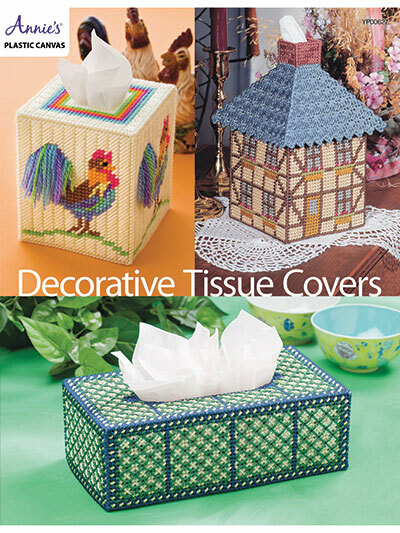 Sizes: Woven Lattice fits a regular-size tissue box; Rooster and English Cottage fit a boutique-style tissue box.